A Rinkya Blog: Edible Gold For Your Coffee! 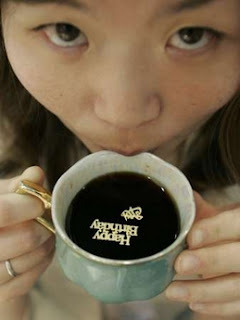 During the 20th Interphex Japan- Asia's largest pharmaceutical industry exhibition, attendees can sip on coffee floating with gold Japanese characters. The company promises it refreshes the body. Longevity, good fortune, hearts and happy birthday gold are just some of the characters available. The gold is edible, but no word yet on if it creates a sparkle in your poop!